Dr. Bruce Herbert, Director, Scholarly Communications at Texas A&M University Library, is one of the people charged with putting the correct tools and systems in place to achieve Vision 2020. Dr. Herbert recognizes that empowering everyone in the university with information leads to better decision-making, which in turn drives everyone toward meeting the strategic goals. When the faculty is unable to tell their story; they disengage. You need to care about their stories for them to care about your vision. Excellence at A&M is the sum of all the parts. It is everyone rowing in the same direction and everyone doing a great job. You need everyone engaged. 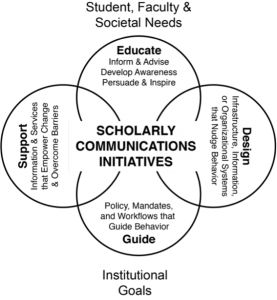 A big part of achieving their vision is an emphasis on scholarly communication. As the director of scholarly communication, Dr. Herbert needed to design a program that satisfied the information needs of a broad range of people. He recognized that change can be hard and needed to clearly define scholarly communication. In brief, VIVO is their researcher profile system. It is a way to present researchers and their work to the outside world. VIVO is driven by ORCID. ORCID provides a persistent identifier as a way to disambiguate authors. 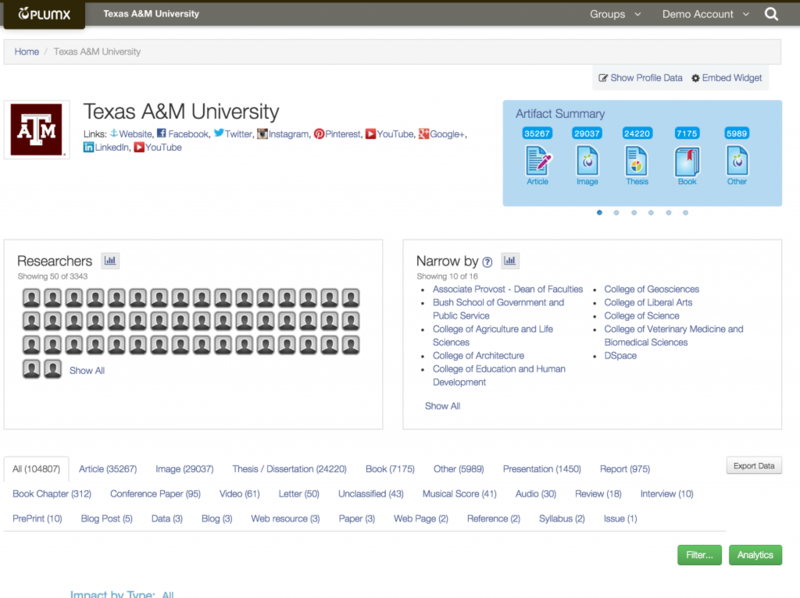 DSpace is the institutional repository that holds research output from the Texas A&M faculty. PlumX is the system that gathers the metrics about the research output, authors, and departments. It is integrated with VIVO for the researcher profile information and DSpace for the research output information. The PlumX Suite is a group of products developed and supported by PlumTM Analytics that helps anyone involved with research output understand the stories about that research. 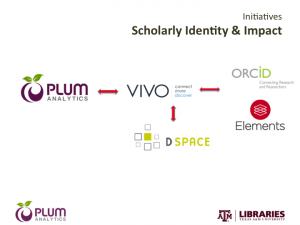 PlumX Dashboards is the product from the suite that Texas A&M is using to accomplish their scholarly communication and strategic initiatives. It provides a way to group research output by researcher, department, lab or any other user-defined group or hierarchy and uncover the stories of the research through dashboards and analytic reports. Texas A&M is using PlumX to empower the faculty and staff to see what is happening with their work. All levels of the organization can access the appropriate dashboards to understand how other researchers and the community at large is using and interacting with their research output. What we see about PlumX is not only are you bringing new metrics to the table, but the Dashboard makes it easy for faculty to see a summary of what is happening with their work. Dr. Herbert explained that prior to PlumX, getting a rapid sense of what was happening with the output was too big of a task to undertake, and that, in turn, made strategic decision-making difficult. A comprehensive university as large as Texas A&M has all types of scholars and not everybody produces articles for scientific journals. What happens with these other groups is that the impact of their works looks weaker when measured with the traditional tools. So these other scholars are really benefitting from altmetrics and PlumX because they now have data or evidence of the impact of their work that doesn’t exist in these more traditional databases. Below is the top-level PlumX Dashboard for all of Texas A&M.